Dr. Brad Bauer, D.M.D., C.A.G.S. Dr. Theodore Opalka, D.D.S., M.S. Dr. Brad Bauer, D.M.D., P.A. Dr. Theodore F. Opalka, D.D.S., M.S. Prevention and early detection are the key to avoiding tooth decay and gum disease. A good home regiment, in addition to regular check-ups and visits, can spare you many expensive dental treatments. Prevention starts with controlling plaque, a colorless bacteria that sticks to the surface of your teeth, and calculus, a harder mineral deposit. These are the main sources of decay and disease. By maintaining a proper routine of daily hygiene, you can avoid most oral maladies. Brushing your teeth and appliances should take at least 3 minutes. For best results, use a brush with a small head and soft bristles. Brush in the morning, after eating, and before bed. Brush the front and back of each of your front teeth. Hold the toothbrush at an angle and use slow, circular motions. Work the brush between the wires and brackets of your braces. Go slowly. Make sure you cover each part of the appliance. Gently brush the gums, too. Brush the top and sides of each back tooth. Also brush your tongue and the roof of your mouth. Rinse with water. Thep use other rinses or gels as directed. Flossing daily helps get rid of bits of food that your brush' can't reach. This helps keep your gums healthy and prevents tooth decay. Tryout different kinds of floss. Some may be easier for you to use. Put 1 or 2 feet, of floss into a floss threader. Thread the floss between your teeth and the wires of your braces. Remove the threader. Wrap the ends of the floss around your fingers. Pull to make a "v" shape. Rub the floss up to the gums and then down the sides of the teeth. Do this between each tooth. Brush and clean as directed by your orthodontist. After cleaning, put the appliance back in your mouth or store it in its case. This lets you brush after eating no matter where you are. This keeps food from sticking to your appliance when you can't brush. Electric and ultrasonic toothbrushes may make teeth cleaning easier. Use prescribed rinses and gels. These prevent stains on your teeth and help keep gums healthy. Remove all elastics and removable appliances. Clean your braces with a soft, rounded bristle toothbrush held at a 45 degree angle to remove plaque and debris. Brush tooth surfaces and gums, applying gentle pressure as you move the toothbrush in a circular motion. Use toothpaste with fluoride as recommended by your orthodontist or dentist. If recommended, use a disclosing rinse to detect areas you may have missed. Floss once a day, preferably at night, using a floss threader and dental floss or dental tape to thoroughly clean between the teeth and brackets. Use hygiene helpers such as interproximal brushes, oral irrigators, and electric toothbrushes. Use fluoride mouth rinses daily to help prevent cavities. If prescribed, use fluoride gel to protect teeth from tooth decay. Brush tongue or use a tongue cleaning device for fresh breath. The parts of your teeth that are covered by orthodontic bands or brackets are protected from decay, as long as the bands are not loose. The area that tends to cause the most problems is the "shelf" where brackets, tubes, and wires stick out away from the teeth. This "shelf" makes it harder to clean the spaces between your gums and the orthodontic appliances. If you don't get these areas clean, the gums swell, get puffy and become even harder to clean. Continued neglect of these areas may result in tooth decay, permanent staining or decalcification of your teeth, and gum disease. Use a soft bristle brush to prevent gum recession. Initially, brush back and forth across the gums and teeth to remove food particles. 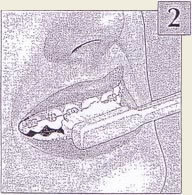 Then, brush in a circular motion between braces and under gums, a few teeth at a time. Brush 10 times in each area before moving on. Scrub the chewing surfaces last. Brush the roof of your mouth and your tongue. Rinse your mouth and look in the mirror to check the half-moon spaces of the teeth between the bands and the gums. When you are finished, the bands should be shiny and free of all food particles and white coatings. If you see red, swollen gums, take special care to massage them with your toothbrush. Electric toothbrushes with a timer are excellent tools that make cleaning easier. We highly recommend their use for all orthodontic patients. Daily flossing is very important! 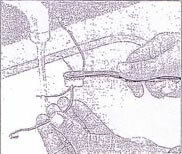 Tie the floss to the end of the floss threader and direct the floss threader under the arch wire. Wrap the ends of the floss around your index fingers. 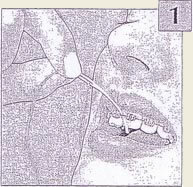 Wrap a "C" around the tooth and firmly guide the floss along the sides of the tooth and under the gum line. Repeat this procedure for each tooth. Please floss once a day at night (before bed) preferably. The use of topical fluoride can aid in the prevention of tooth decay and decalcification (white marks on the teeth). We recommend that our patients use a fluoride rinse twice a day while they are wearing orthodontic appliances. Early signs of gum disease include redness, swelling, or inflammation around the gum line. If these warning signs appear, your dentist will check for hardened plaque, also known as tartar or calculus, below the gumline. Finally, your dentist may use a tool called a probe to test gums for bleeding and measure periodontal pockets. When gums are unhealthy, they pull away from the teeth, forming these pockets. Deep cleaning can effectively control and reverse gum disease by removing the germs that lead to infection. This deep cleaning involves techniques called scaling and root planing. Scaling involves scraping away plaque and tarter from above and below the gumline. Planing involves smoothing out rough surfaces of teeth which can foster the bacteria growth that leads to infection. Left with clean, smooth teeth, patients will notice reduced redness and inflammation as the gum is better able to attach to the tooth enamel. Dentists may prescribe antibiotics or mouth rinses to kill any remaining bacteria after scaling and planing procedures are performed. Periodontal disease is marked by the breakdown of structures that surround, secure, and support the teeth. These structures include the jawbones, gums, and fibers which anchor the teeth to the gums. Periodontal disease is usually a result of untreated plaque buildup, and is the number one cause of tooth loss in adults. However, regular checkups and a strong home care regimen easily prevent periodontal disease. Gingivitis is the early stages of periodontal disease, when only the soft tissues of the mouth are affected. Plaque buildup leads to tartar and bacteria below the gumline, which leads to inflamed, irritated, or bleeding gums. The good news is, gingivitis is reversible. A good professional cleaning, followed by regular brushing, flossing, and checkups, restores gums to good health by removing plaque and bacteria. It is very important to see your dentist before, during, and after orthodontic treatment. Follow up with regular cleanings approximately every four (4) to six (6) months. Please remember that your appointments with us do not take the place of your regular dental checkups with your family dentist. If you do not have a family dentist, we would be happy to give you the names of several in your area. 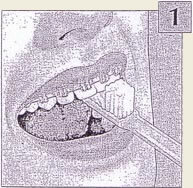 Examine and assess gum health; test for gum disease. Examine any existing tooth decay. Take and analyze x-rays, which may reveal decay, tumors, cysts, and other problems. 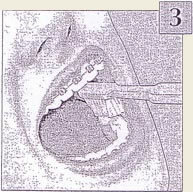 Screen for the presence of oral cancer. Verify the stability of any existing fillings or other restorations.